308 Winchester Ammunition is a simply called “308 ammo” by most rifle shooters today and is among the most popular rounds used by American hunters. An American-designed rifle cartridge without a rim, .308 ammunition is the commercial or civilian version of the NATO 7.62x51 round. Introduced in the 1950’s, 308 Winchester rounds are most frequently used by hunters but a growing tactical crowd is adopting the powerful caliber for use in carbines and other self-defense platforms. Is .308 Ammo Safe to Shoot in 7.62x51mm Rifles? Can I shoot 7.62x51 ammo in my .308 Rifle? That's a very common question among shooters. The short answer is that you can fire 7.62x51 rounds in a .308 rifle safely but it's not suggested that you fire .308 ammo in a 7.62x51mm rifle. 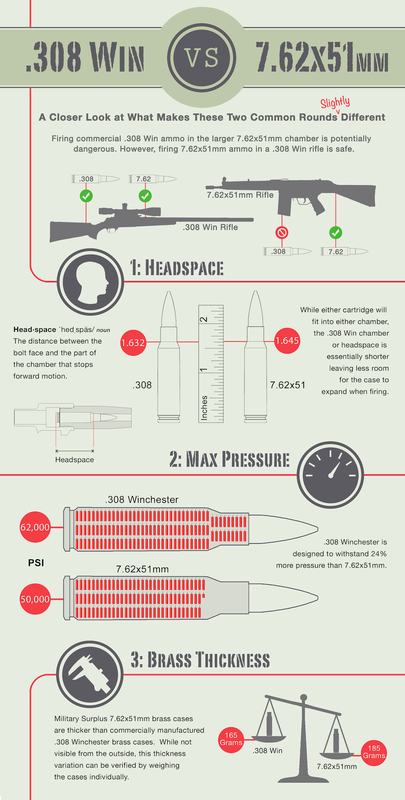 The .308 civilian firearm evolved from the military 7.62x51 rifle. In fact, the 308 Winchester made its debut two years after NATO adopted the 7.62x51mm rifle for its military purposes. While the cartridges are very similar, there are some subtle differences that may play a role in how comfortable you feel using them interchangeably. The image below illustrates those differences and what it might mean for you as a serious shooter. Traditionally, shooters will use the full metal jacket (FMJ) rounds of .308 at the shooting range for target practice. Common FMJ .308 ammo is typically available in bulk here at BulkAmmo.com. PMC’s .308 Win Ammo is a popular choice for plinking or range use. More elaborate bullets or projectiles are available for hunters or match-grade shooters. These cartridges feature expanding hollow points or soft points that can do significant damage with their target. Shooters looking for match-precision will most likely be interested in rounds containing the highest quality components like Federal’s Sierra Match King, a round that features a hollow point boat-tail bullet along with exceptional performance and incredible accuracy. Remington is one of the more popular manufacturers of 308 hunting ammo and their Core-Lokt bullet is a very well-known choice for American whitetail deer hunters. You can find the 150 grain 308 hunting round here at BulkAmmo.com. In terms of performance, you can find a fairly narrow breadth of bullet weights available for 308 rifles. In common use, the lightest projectile available is generally a 150 grain round that offers a muzzle velocity of around 2,800 feet per second. Keep in mind, there are some very light loads available that are less common. For instance, Hornady does offer a 125 grain 308 round promising reduced recoil. The heaviest round, most frequently used in match-grade rounds is 175 grain and travels at about 2,650 feet per second in terms of muzzle velocity.